"My mother made a version of these when I was growing up. 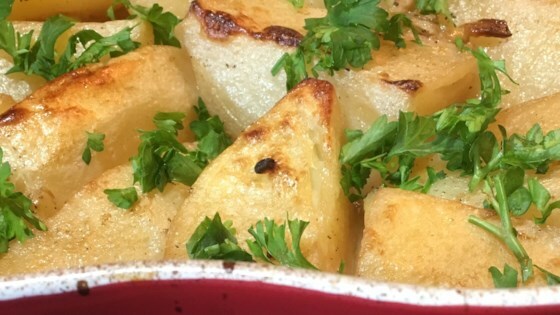 Just the smell alone of these garlicky lemon potatoes is comforting." Place the cubed potatoes, water, lemon juice, vegetable oil, and olive oil in a 12x18 inch baking dish or roasting pan. Season with oregano, salt, pepper, and garlic. Roast, uncovered, in the preheated oven until the potatoes are tender and golden brown and the water has evaporated, about 1 1/2 hours. Stir the potatoes every 20 minutes as they bake, adding more water as necessary to prevent sticking. Allow the water to evaporate during the final 15 to 20 minutes of cooking, but be careful that the potatoes do not burn. Stir in the chopped fresh parsley, and serve. These smelled heavenly while they cooked. And they're super easy to make. Unfortunately, they were FAR too lemony for my family. I'll try these again, but only use half the lemon juice. What a quick, simple and wonderful recipe. No leftovers that night. I kept the skins on poataoes for that extra texture. Very tasty with these modifcations, triple the garlic, double the oregano and black pepper, use chicken stock in place of water and omit salt (as the chicken stock removes the need for it). Excellent taste. I agree with previous reviews: if you're using stock, don't use that much salt. I also used all olive oil instead of vegetable oil.